Alexis Soloski did a nice article in the Village Voice about Multimedia in Theater. Here are our responses to her questions. 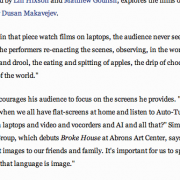 Alexis Soloski wrote an article in the Village Voice about Multimedia in Theater. Here are Jemma Nelson and my full responses to her interview questions. AS–> I understand this piece, like much of your work, makes ample use of live video. How does the video story intersect with the form)? B!G–> The use of live video continues Big Art Group’s investigation into the construction of the Image and the gap between Realness and the Real. In this particular piece, a roving tethered “documentary filmmaker” provides a framed point of view, while surveillance cameras provide shots of otherwise unseeable spaces. There is no separation of content of the piece from form, this is an ancient division of labor to which we do not subscribe. In our performance model, all information, from the biographies of the actors to the sound effects, interact to construct the Image-Event. 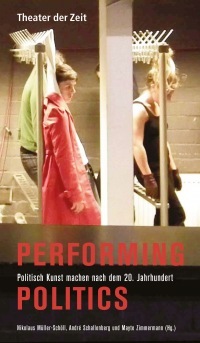 B!G–> We make performance, so providing theatrical justification doesn’t interest us. Big Art Group focuses on the breaks and fissures in the constructed image. A question of framing (who is framing and what is beyond the frame) runs throughout the work. AS–> What attracts you to use video in the theater? What does it permit that unmediated performance wouldn’t allow? B!G–> We are all voracious image eaters and producers. We create and consume images daily. It is the international language of commerce and anti-commerce. We video-chat, blog, tweet, and post images to our friends and family. Big Art Group understands that our audience has a facility with technology and reflects that in the construction of our live work. Its important for us to speak the language of the everyday and that language is Image. AS–> Are there any drawbacks? Theater’s selling point has always been its liveness, the idea that living spectators and living actors together create and event in a particular moment, what theorists like Grotowski call “communion.” Film and video can interrupt that liveness. What do you do to bring the audience back? To make sure they’re communally engaged? B!G–> ‘Communal engagement’ has a different meaning today, considering the rise of social media and online networking, and by that measure traditional theatre that spurns technology fails to address a whole host of contemporary social issues from new conceptions of identity to power and economic structures that shape current experience. We created our performance ensemble in order to speak a contemporary language, and so we feel compelled to engage and confront these issues either by technological strategies or by whatever tools we find useful. For those who have a preconceived idea of what theatre ‘should’ be, I would not recommend one of our events; we make work for the curious, the queer, the rebels, and the monsters. AS–> What are the things you would like to do in the theater in terms of effects and possibilities that technology doesn’t yet allow? B!G–> We are from the future. We hope that our work will lead us back there, soon. http://secureservercdn.net/198.71.233.204/9d3.d38.myftpupload.com/wp-content/uploads/2012/01/Screen-Shot-2013-07-18-at-11.42.57-AM.png?time=1555789772 335 569 Big Art Group http://secureservercdn.net/198.71.233.204/9d3.d38.myftpupload.com//wp-content/uploads/2013/07/bignontranslogo3.png Big Art Group2012-01-16 15:52:002013-07-18 11:45:08Alexis Soloski did a nice article in the Village Voice about Multimedia in Theater. Here are our responses to her questions. 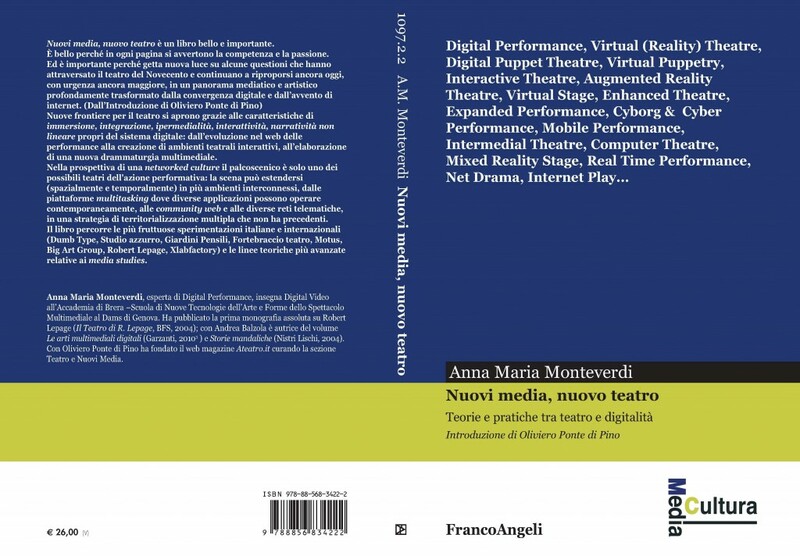 Big Art Group is included in “New Theater, New Media: Theories and Practices of Theater and The Digital” just released by the publisher Franco Angeli in Italian (Milan) by Anna Maria Monteverdi with an introductory essay by Oliviero Ponte di Pino. http://secureservercdn.net/198.71.233.204/9d3.d38.myftpupload.com//wp-content/uploads/2013/07/bignontranslogo3.png 0 0 Big Art Group http://secureservercdn.net/198.71.233.204/9d3.d38.myftpupload.com//wp-content/uploads/2013/07/bignontranslogo3.png Big Art Group2012-01-10 22:40:052012-01-20 10:33:56In Print: Big Art Included in "New Theater, New Media: Theories and Practices of Theater and The Digital."